I can’t remember where I came across Mary Anne Mace‘s designs, but I’m in love. I follow her on Instagram and she knits shawl. The most amazing shawls. I haven’t knit any of her designs, but I need to. The problem is once I start I’m going to need to knit all of them. Most of my favourites, Minarets and Lace, Southern Blue, and Mad Blood, aren’t in her GAL bundle. But Sea Fog is. I love the elegance of this and the detail she puts into it. I think I’m going to have to knit it to find out how she’s put it all together. What draws me to shawl designers is how they’ve connected the different elements of their designs. Often with lace shawls I see designs where one section doesn’t flow easily into the next. There seems to be little connection between the shapes and details of each section. Mary-Anne Mace’s designs aren’t like that*. The pieces fit together in a way that is aesthetically pleasing. Some of Mary-Anne Mace’s designs are 25% off as a part of the Indie Designer Gift-a-long, but hurry, it ends tonight! 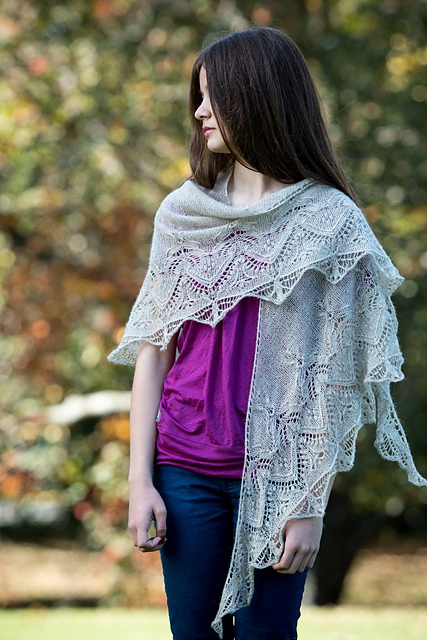 *Rosemary (Romi) Hill is another shawl designer who’s work I adore for the same reason.